We’d reserved a little apartment for our first two nights in Trogir, but beyond that, we didn’t know where we’d be staying. Our first night in town, warmed by a vintage blanket that bore a tag ‘Made in Yugoslavia,’ we pondered our strategy for finding an apartment. We also tried to remember discussions from our high school current events classes that touched upon the Balkans’ war-time chapters, and how Yugoslavia eventually fragmented into six countries. In a town as peaceful as Trogir is today, it was hard to imagine Croatia as a battle zone just two decades earlier. 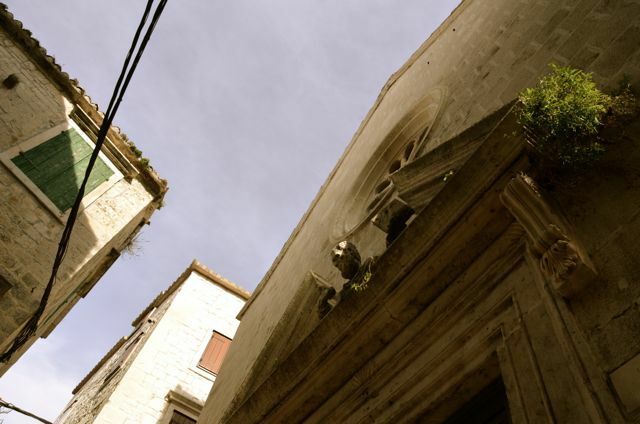 As we pounded the cobbled lanes the next morning, we were surprised to find that Trogir, a city of approximately 13,000 people, was largely a ghost town during the winter months. Hotels, restaurants, and private rooms, known locally as sobe, were shuttered. Though we were growing increasingly nervous that we wouldn’t find a suitable place to stay, we were thrilled by the sight of citrus and kiwi plants, cheery daffodils, and the silhouettes of palm trees on shuttered buildings. 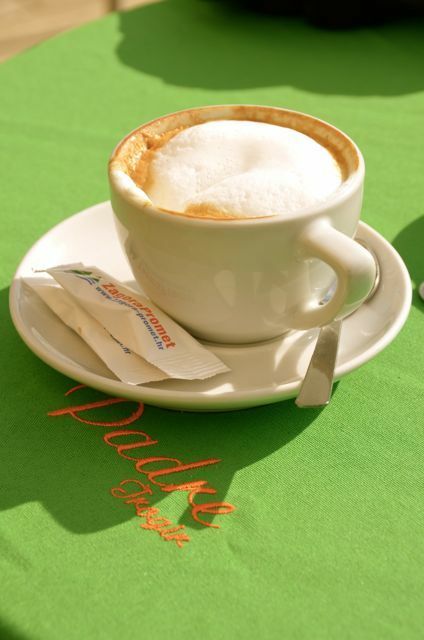 We stopped for a cappuccino at the cheery Café Padre, and soaked up the Croatian sun, while watching a group of school girls chase each other around a Corinthian-style column, topped with the red, white, and blue Croatian flag. At the seaside, we met a Croatian teacher, originally from Bosnia, who tried to help us find us a place to stay. In our own versions of German, we conversed, but she swiftly had to return to school since her lunch break was drawing to a close. As we parted ways, she taught us a new Croatian phrase, bok, or ‘goodbye’. 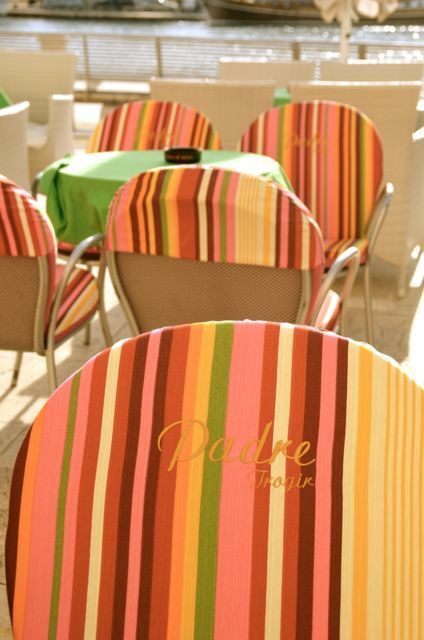 As we departed our seaside seating, we discovered the power of word-of-mouth advertising. A seamstress (with a fluffy dog outside her door that drew me in to her corner shop), referred us to nail salon owners with an unavailable apartment, who in turn handed us off to a pizzeria owner with vacant apartments. And so it was that we found our home away from home – a charming studio apartment above the Pizzeria Mirkec – a spot guaranteed to tempt our tastebuds at every turn. As we headed back to our temporary hotel to pack our bags, we passed under a clothesline traversing a classic courtyard that seemed almost in ruins. We then glimpsed a column engraved in Latin, a grandmother tending to a dusty carpet in her open window, a handsome fortress tower, and a man gently calling a tabby cat to his green doorway. Lost, yet pleasantly disoriented, I thought to myself, I think I am going to like it here in Trogir. Let the adventure begin. Have you visited Croatia or other spots on the scenic Dalmatian Coast? If so, I’d love it if you shared any special travel anecdotes. Which destinations or experiences in the Balkans are you eager to recommend? 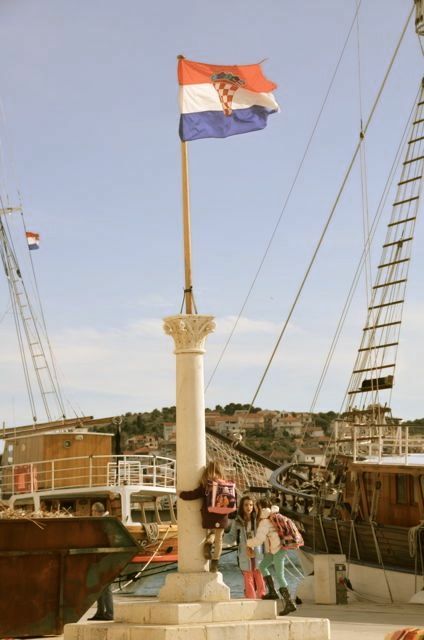 Very nice post Tricia, last time I was in Croatia I was part of an aid convoy during the war, it looks a lot nicer now. That must have been an interesting chapter in history to have been here, Mark, and I’d love to hear your stories. Do you remember what cities you went to? It was pretty intense, first stop was Gospic which was a hospital town at the time, then onto Zagreb stopping on the way at camps to hand out gifts and things of need to mothers and their children, great experience but also some sights I would rather forget. It’s hard to imagine the Balkans during such a violent chapter. I was in Kosovo in 2001 (accompanying civilians trying to improve libraries in the region). Eye opening indeed. Would certainly be in my Croatia Top Ten! 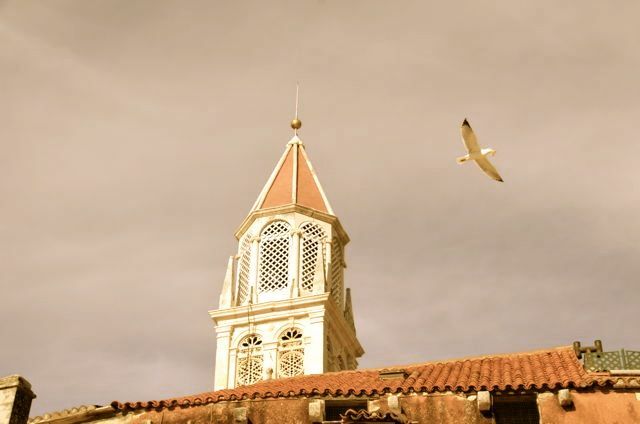 Did you climb to the top of the Bell Tower? That is scary! What other spots can you recommend in Croatia? Do you have a blog post detailing them? 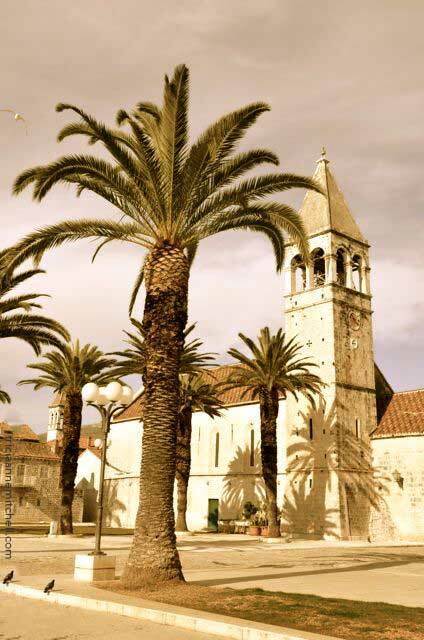 I would suggest the lovely village of Primosten and the city of Split both quite close to Trogir. 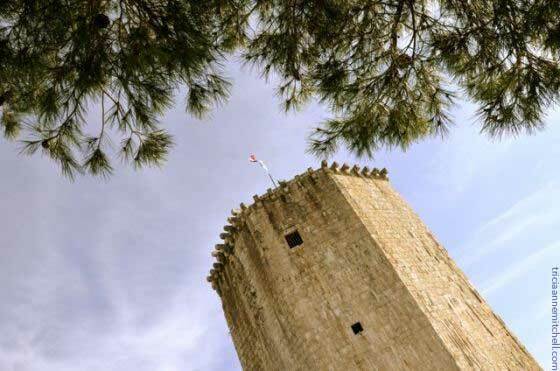 This is my account of the climb to the top of the tower but don’t let it put you off: http://anotherbagmoretravel.wordpress.com/2012/07/07/croatia-trogir-tower-of-terror/. 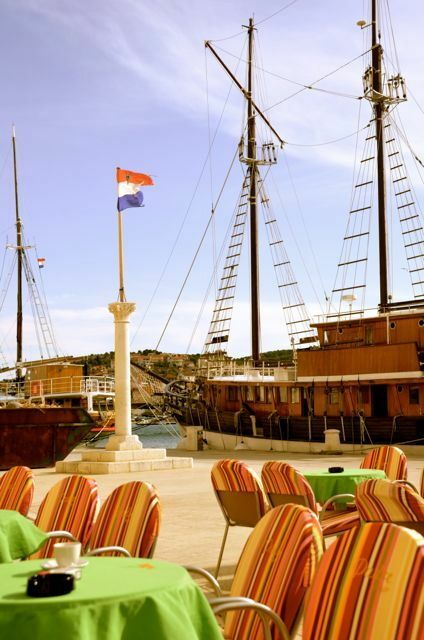 Try the islands as well – Hvar is especially nice but a little bit expensive. We’re staying in Trogir for at least a month, and Split is on the agenda of course. Primosten and Hvar also look gorgeous! I appreciate your Podstrana recommendation too. We’ve been to Dubrovnik once before, but would love to pop in and see it again, if only for a day trip. It’s fun being here during the off season (even if it is a bit chilly) because we have Trogir largely to ourselves. 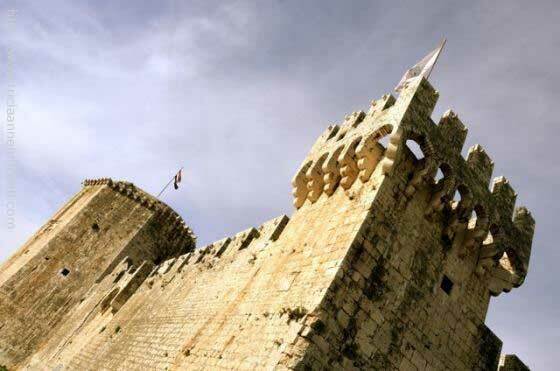 Did I mention that my stomach is in knots after reading your Trogir Tower of Terror posting? I’m not sure I can ascend it now. It sounds truly frightening, and I’ve climbed a lot of aging towers. I may have exaggerated a little! There is also a good view from the top of the castle. Dubrovnik is wonderful but when the cruise boats turn up can be hellishly crowded. If you go north Skradin and Krka National Park is worth a visit and so is the city of Zadar. 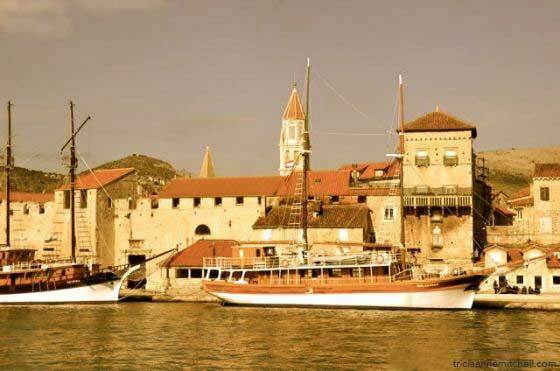 Enjoy your sojourn in Trogir! Hvala, Andrew. the staff at the pizzeria below highly recommended Krka National Park, and my husband is itching to see Zadar. I think we passed through it on the bus ride here. As always, it’s wonderful getting advice from such a well-seasoned traveler. Do you have your next excursion planned? First of all, I loved your Freya Stark quote. It set up your story so nicely. 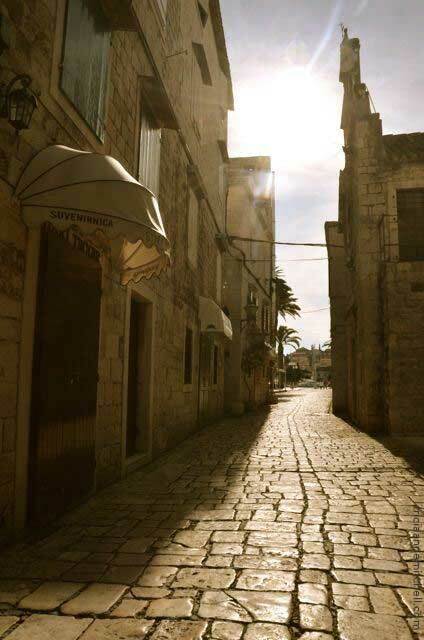 I felt like I was wandering the streets of Trogir with you, and I loved it. It seems like you have the whole place to yourselves! Heavenly. I can’t wait to read more. This is not a place I’d thought about visiting, but now, if I do, I think I want to go in the winter months, too! I loved Stark’s quote too. Whenever I wake up in a new place, it seems as though most everything is possible. 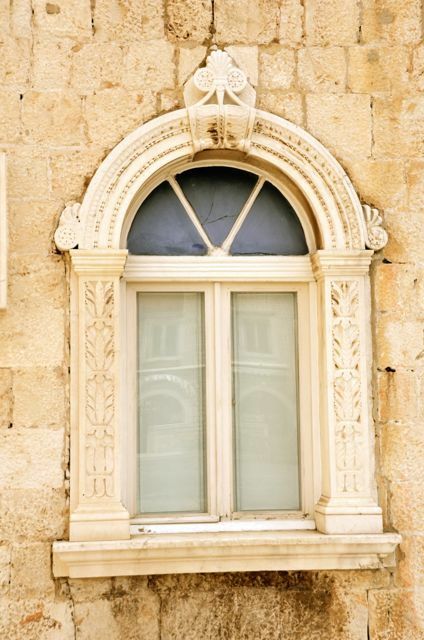 Another selling point for you for Trogir is its proximity to Split, not only for its airport but its architecture. 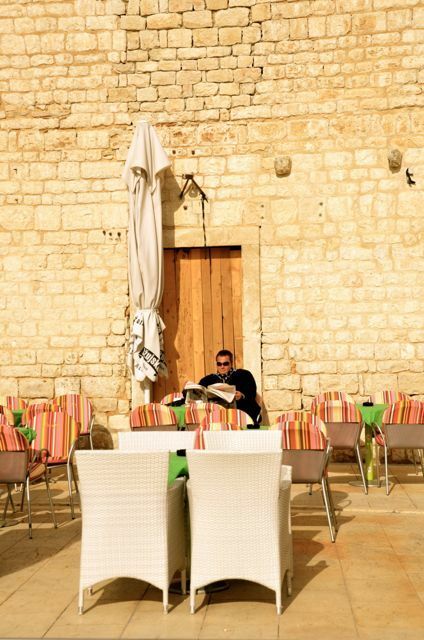 We haven’t visited there yet, but Diocletian’s Palace sounds divine! It’s only a short bus ride away from Trogir. Wow – it sounds like such a different pace of life from my visit in the height of summer. What a great opportunity to meet more local people vs tourists. Love how how you found an apartment through word of mouth as you were passed along to the person who could help you. I hope you are able to overcome your fear of heights to climb the tower…I always find them so fascinating. Enjoy. I can’t wait to read more. I agree that exploring the inner workings of cathedrals and bell towers is fascinating, Anita. As I looked up at the tower this late afternoon, during our walk around town, it was illuminated in the setting sun and looking quite inviting. We’ll see what the future holds, specifically if I can conquer my fear. 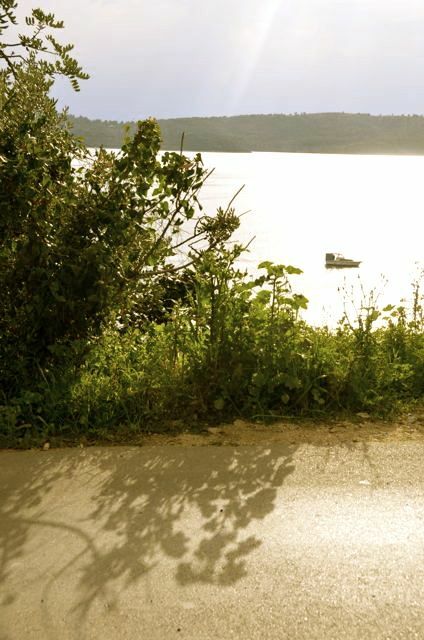 Knowing how much you travel, perhaps you’d want to return to this region in the off season? I also visited the Balkans in the summertime some years ago, and remember how hectic Dubrovnik was. It’s quite nice now, but it would also be fun to see all the squares’ umbrellas unfurled. Tout simplement grandiose ! Merci pour le dépaysement ! 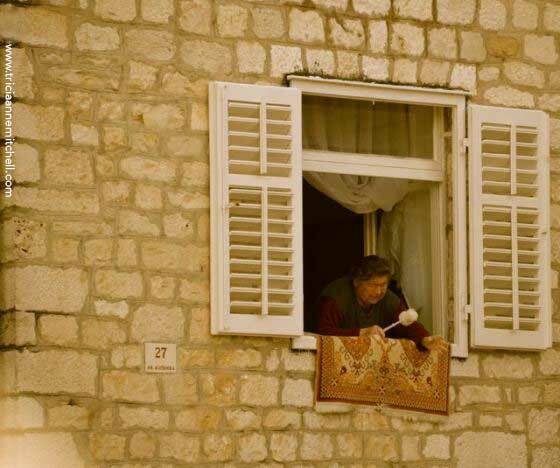 Intriguing photographs of Croatia. Tricia, the photographs of the elderly lady shaking her duster out the window, and the gentleman with the cat were especially delightful. V.
Virginia, thank you, or as they say here in Croatia, hvala! Since it’s quiet tourist season here now, it’s been fun watching the locals at work and at play. How lovely to have the place to yourselves. You can enjoy all that beauty in peace. Wonderful photos! Looks like an amazing place! Amazing indeed, Phil. There’s thousands of years of history here! I’ll be sharing more tidbits about that in the coming days. Please stay in Croatia, Tricia. This is such an exquisite post that I can’t bear for you to leave. 20+ years ago we were in Dubrovnik and Cavtat. I would love to return to see the north of the country. It would be fascinating for you to return to Croatia now and see how it’s changed from two decades ago. Dubrovnik I’ve been to, but Cavtat I had to look up. 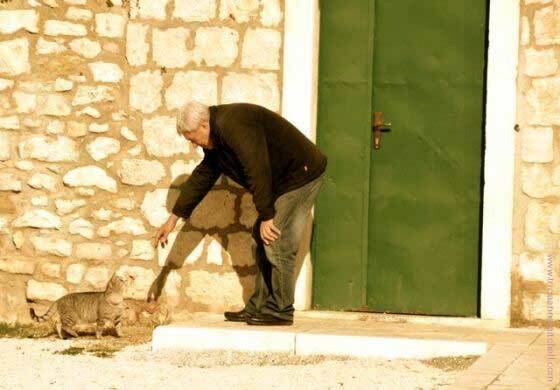 Not far from Montenegro? Perhaps we’ll have to see if we can explore it! It’s so fun getting ideas from fellow bloggers. Thank you. Croatia looks amazing, your pictures remind me a little of Malta. It must be great to be somewhere relatively summer-like after all this bavarian snow. Have a great trip and I look forward to reading all about it. While we were strolling Trogir’s streets the other day, I thought the same thing. Perhaps it’s the nautical element, or the limestone buildings and narrow roadways? The narrow roadways and palm trees are probably what reminded me most of Malta. It really does look lovely there, it gives me hope that Spring is somewhere not too far away from a very chilly Bavaria! In our part of Bavaria it is cold but not any colder than usual. Will you be returning? 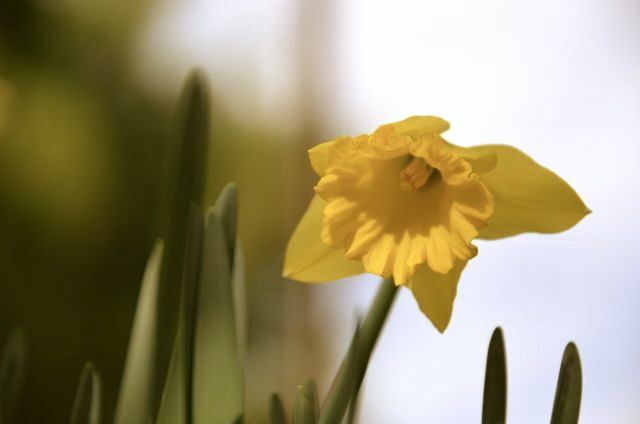 Well today was almost Spring-like, warmer and sunshine! So by the time you return you should have some nicer weather. It would be great to meet up. I have yet to go on a good mountain hike in Germany so I could come down to meet you sometime. We are near The Ammersee in a village called Raisting. Looks like we’re just about an hour apart – that would be fun! ha, some sunshine would be lovely! Yes I read an article on The Local that said Germany as a whole I believe had had its darkest winter since 1951, with 55% less sunlight than usual. I have only spent two winters here but my Bavarian friends say this year has been extremely grey. I don’t think I will spend a full winter here again! Roll on Spring is all I can say. Enjoy Croatia and keep me posted as to when you are back. Laura, I lived in Heidelberg for 10 years, and of course it experienced Germany’s infamous grey winters, yet I never remembered Heidelberg being so dark as it was in Oberammergau this winter. I guess the article you read explains it! I know you two were previously in Australia. Where do you think you’d escape to in the future? What is Heidelberg like? I have no idea where we will go from here! I would love to just pack us all up in a big bus and drive all over the world. But maybe we need to set down some roots somewhere first, We’ll see. I will be in England for a few weeks soon, and I also hope to get back to gorgeous Gozo at some point this summer. PLus there are so many places to explore from here in Bavaria. Laura, Heidelberg is beautiful, but of course I’m biased, having lived there for a decade (and married in the castle). I started my blog just as we were preparing to move, so I don’t have lots of pictures from Heidelberg, but you’ll find some under the Travel-Germany tabs. It’s a fun, university town, with tree-covered hills (perfect for hiking) mountains (depends on what kind of landscape you grew up in if you’d call them one or the other) and the Neckar River to enhance its beautiful old town architecture. Isn’t it funny how one can feel a tug between nomadic and nesting ways? I can very much relate to your comment and uncertainty. When do you leave for England? Heidelberg sounds lovely, we will have to visit someday. Yes it is very much a tug between nesting and nomadic, you nest for a while then want to get out there again, then you travel and after a while you feel like nesting. Just combine the two! Leave for England next week which is very exciting. Enjoying reading about your time in Croatia. Spring arrived in Bavaria but winter is now back, so you’re not missing much. Staying there until Summer is a very good idea. Wishing you safe travels to England, Laura! Which city are you headed to and how much time will you spend there? Thank you! I will be in London, Essex and heading to Suffolk too, visiting friends and family. Beautiful post, Tricia. It is a wonderful thing to have a place to your own, without tourists off season. Many years ago I went off season, to venice by train; it was November, cold and misty and I discovered this lovely city on my own in a very different view as I have seen Venice many times before during summer times. It’s just a different pace and you really see the locals being among themselves. 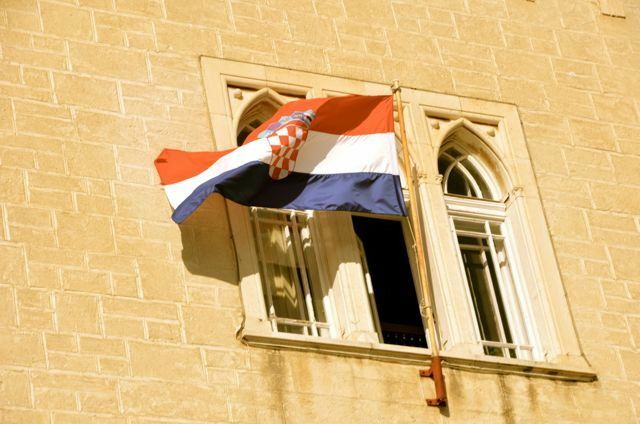 Croatia is very beautiful, I was a child when my parents took us there for summer vacations, oh gosh some 40+ years ago, we saw all the cities which some of them I remember as being surpressed and depressing, yer I loved the architecture if I remember correct it was under Tito’s times. If you go further up, Triest is very beautiful too. 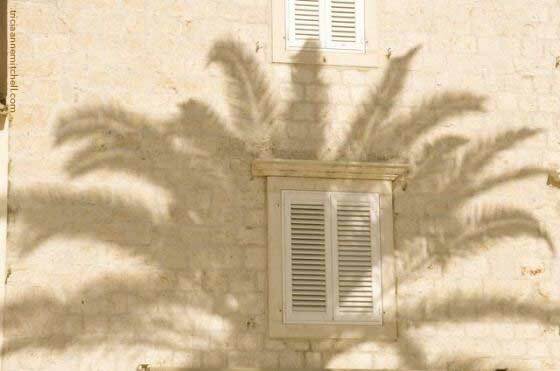 We mostly spend our summer vacations on different islands, most names I don’t remember anymore, but there was Hvar and Raab or Rab, as than as a child I found very exotic. Enjoy your time. 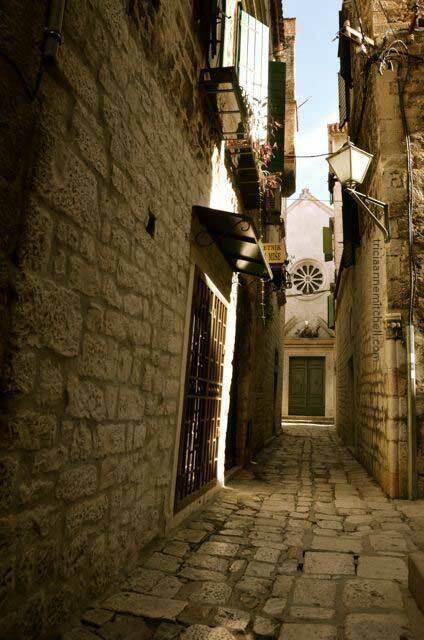 Cornelia, what a grand adventure that must have been for you as a little girl, exploring the Croatian villages’ tangled passageways and nooks and crannies. It would be fascinating to see what the country looked like during that time. 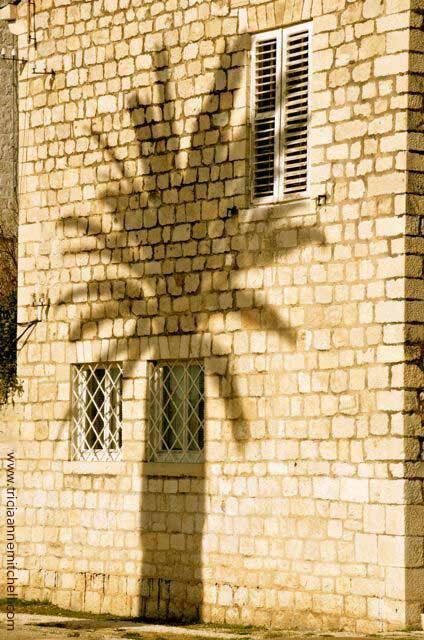 We might visit Hvar in the coming weeks. I’ve read that it’s particularly beautiful during the lavender season. Trieste has gorgeous architecture, and such a commanding geographic position! I’ve briefly visited it twice while driving to and from Slovenia and Italy. It’s an intriguing part of Europe. Thank you Tricia, I am not sure if my father took pictures, but he created little 12mm black and white movies. I am so grateful that my parents traveled a lot with us kids and exposed su to so many beautiful places in Europe, I guess i kind of inheritated that “wanderlust” and later in my adult life I discovered so many foreign countries over the world. So enjoy what you see with your “lens eyes”. “Lens eyes” – love it, Cornelia. Like you, I suppose I acquired the wanderlust gene from my parents and paternal grandparents. I made my first international trip (that I can remember) in 2nd grade to Germany. I remember loving the hot chocolate and whipped cream, and the fast rides on the Autobahn. Looks like a wonderful stop! I pinned some photos for safe keeping. 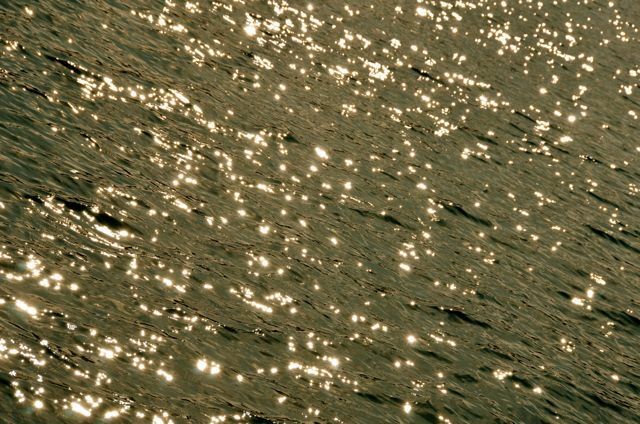 It’s nice to hear that the visuals from this beautiful spot on the Adriatic have inspired you. You’ve got quite a collection of pleasant boards! Thanks for commenting on my blog earlier…I’m glad you did because I discovered your beautiful site! :) I went to the Istrian peninsula and stayed in Rovinj for several days back in 1997. It was beautiful, but I know the country has changed a lot since then, and people complain about there being too many tourists there now. Your time there doesn’t show that, but as you said, going in the off-season made the difference. Beautiful photos! Jenna, thank you for your lovely compliment. I’m flattered! As one who appreciates art and architecture, I’m a fan of your quality work. My husband and I debated whether or not to start off near Rovinj, as we heard it has a lot of character. We eventually (somewhat randomly) decided on Trogir and we’re quite happy with that decision. It must have been interesting visting Croatia earlier on, as you did. I was also here in 2007 (Zagreb, Dubrovnik) and Dubrovnik was bustling with visitors during the summer months. 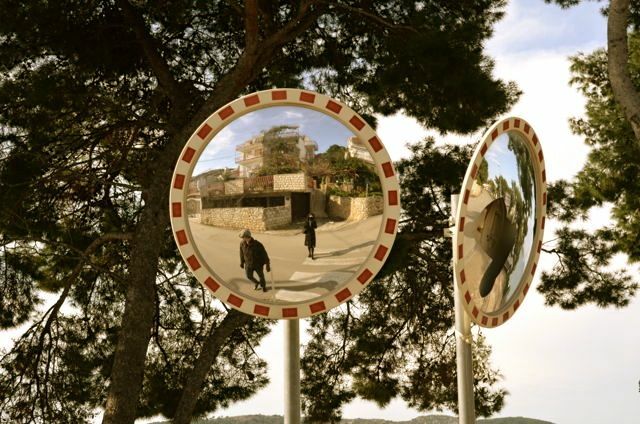 It begs the question – what is the next Rovinj, the next Dubrovnik? Yet again you tempt me, you travel siren! I have not been to this part of the world yet, apart from a layover in Zagreb airport back when Yugoslavia still existed. My friends and I once debated whether or not an airport stopover constituted a visit to a country. This was largely to determine whether or not the ladies could acquire a silver charm from that country. :) We’re still undecided. Perhaps once your studies let up, you and your family can explore this region? Having been here in summer and winter, I declare it to be a great get-away (though things are rather quiet now). Are you going to go North? I like Opatija. Pula is supposed to be very interesting. I also loved Slovenia. They have some cute towns on the Adriatic, as well… Piran, Slovenia! I absolutely love Croatia and Slovenia. I was just going to mention how I love the wine in both countries (they are hard to find in the U.S.) and then I noticed you have a link just below this about California wine. Are you enjoying the Croatian wine? Perhaps on the way back to the EU countries we will check out Opatija. We had to leave Schengen (90 day tourist maximum) and Croatia seemed like a perfect destination. 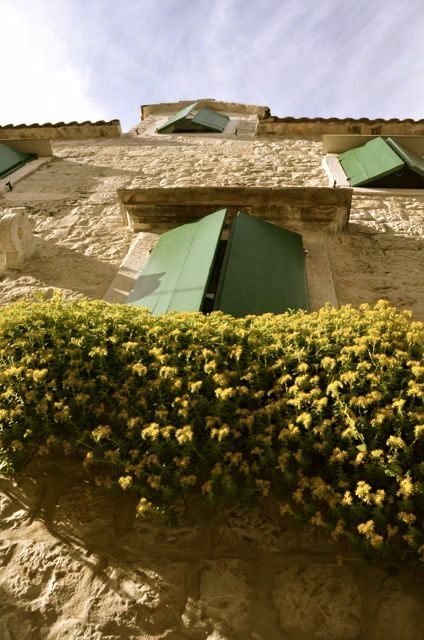 We debated starting out in Rovinj, but then read about Trogir and thought, why not? I love that many of the locals here are into winemaking. Our apartment owner, for example, let us try a delightful wine he’d made himself. 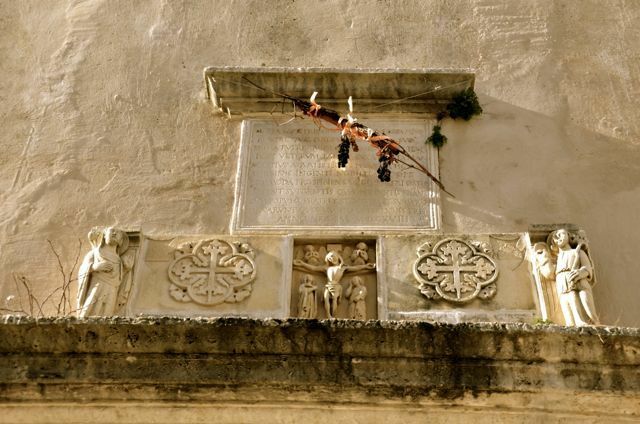 And, we recently learned that the ancestor for California’s Zinfandel is actually Croatian. My pleasure, Craig. I look forward to getting more landscape inspiration from your comprehensive site! 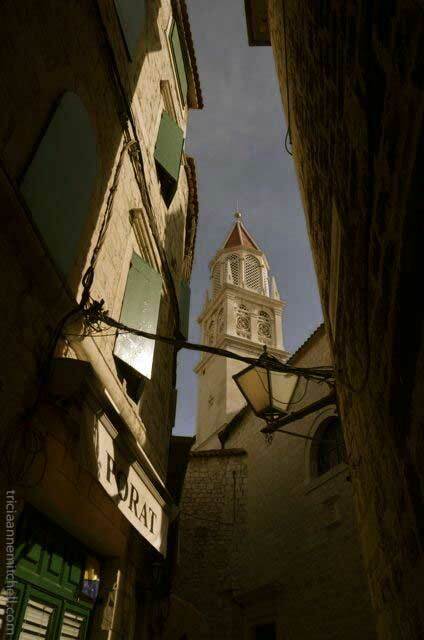 Trogir looks charming. Your story of how it feels in the winter reminded me of my time in Rovinj last winter. It’s always fascinating to see these summer destinations in a truly different light. Suzy, I’ve heard Rovinj is a beauty! We contemplated heading there, but as fate would have it, we landed in Trogir first. What other spots in the country or the Balkans were your personal highlights? Jenny, during which month do you think you’ll be in Rovinj? We’ve been in work mode for much of the past 3 weeks, but excited about a wine tour we are doing tomorrow. Of course, I’ll be sharing the details here! We’ve enjoyed Trogir so much that we even decided to extend our stay by another 2 weeks. Tricia, this is a remarkable series of photos. Brilliant! What wonderful photos, – the architecture, the light and shade, the beautiful architectural details and the human interest – all there – and an utterly satisfying blog..loved your stories…. So delighted to have found you, thanks to you visiting my blog, and I will enjoy exploring the rest of your explorations! Valerie, that’s kind of you to say! The people we meet along the way are indeed what makes travel special. Until next time, I wish you a wonderful weekend. What a terrific post you have made. Wow. A wonderful description of the area and so many beautiful photos of a place I have never visited but now truly hope to one day. So many thanks. Rick, thanks for taking the time to leave such a kind comment. 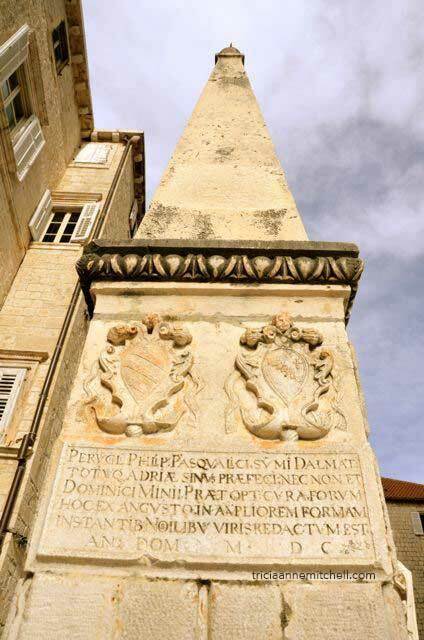 This post offered my initial impression of Trogir, and we finally went on a walking tour of the town with a new friend last week, which helped answer many questions that we had about the history/architectural flourishes. I do hope you’ll make it here – the region has so much to offer. In just a month, we’ve done the wine tasting, wild asparagus hunting, an elementary school visit, and a sailing trip. The people that we meet are of course what have made our visit the most special. I think yours have encapsulated Croatia’s allure well, Renuka. :) Which places did you most enjoy there – or which are on your must-see list? It’s always nice to connect with a fellow traveler and shutterbug enthusiast. Thank you for dropping by.